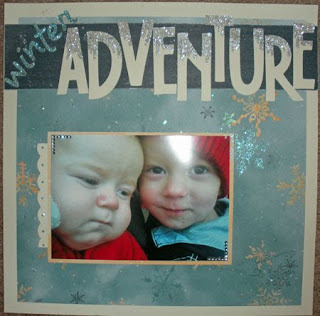 OK - I'm jumping in to blog about stamping and scrapbooking. Here's a peek at the last Layout I finished. 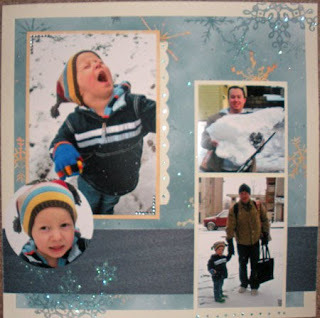 I used an older paper packet, Aspen, but I just LOVE the snowflake background! These are the new Glitter Rub-ons, which are way more subtle than a glitter addict like me might like, but it's a beautiful effect. I used the glitter sheets and my old favorite Write N Rub Pen to detail the title - loving my new Cricut (Thanks to Kelly K!). I also cut up the rhinestone frames and added extra glitter details to the snowflake background with my trusty Write N Rub pen plus my beloved Prisma Glitter. I love that pic of you and John, I noticed it on FB, but didn't see the other pics, those are so precious!! !